but I couldn’t get rid of that voice. I cried when he hit the can. She smiled. I could try again. that donkey was just the right size. 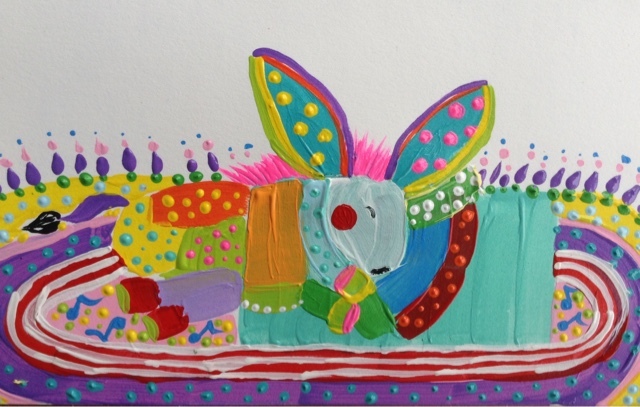 This was a donkey that I painted inspired by the poem above by Naomi Shihab Nye. I decided to paint a napping kindergarten donkey, because I actually saw one of my daughter's kindergarten teachers angrily throw away a child's painting and make him start again, so perhaps there was something healing for me in painting a wildly colored donkey, dreaming away on his colorful nap mat, perhaps protected from any harm to his creative spirit and unique process of learning and meeting the world. I was so startled to witness the teacher's actions, I wondered if it had happened to him or to me. At the time, I only hoped that my daughter wouldn't be targeted, as I wasn't sure where the teacher drew the line between an acceptable or unacceptable painting of the ocean and seaweed. My daughter didn't seem to notice, and somehow the little boy seemed okay too. Perhaps we as adults have the chance to make a few mistakes before anything sticks too much. However, the wounding in me felt fresh and raw. A memory of external and internal forces that had judged me as wrong or bad, or not good enough were stirred up from the deep. This sensitivity has shaped my teaching. That and my parenting guilt! I have often wished I could be as loving and patient to my children, as to my students, but I have grown much in understanding of all of the variables involved. My students also treat me exceptionally compared to some moments with my kiddos--so, I also do not judge this teacher. None of us can be perfect and aware all the time. As a teacher in the arts, I feel an awesome responsibility not to kill the creative spirit in a developing student. I also strive to instill in them a great permission to explore, to learn, to not know, to not be perfect, but to be totally alive with their learning NOW. I tell them that they have what skills and creativity they need within them, just ready to be woken up in their own way and time! Their creative spirits peeking out are blessings to me. I love watching them wake up--and not just the children--adults too! I love when students shift from, 'oops I played a wrong note,' feeling embarrassed or ashamed, to 'hey, where did that note come from, it wasn't there before?! It just jumped out in front of me!" There is laughter and the delight to try again. However, I also know that learning is hard work and requires attention, practice and commitment that we are often not used to, especially in this day in age, where everything has been made easy. I find this problem with myself in the kitchen. I have a hard time working too hard in there to be creative, even if I know it would be my bliss to be a magician of exotic spices and more complex recipes. I often think back to my time spent as a student in France with the most precious Iranian family, and the food that I tasted at their table. I was often in tears it was so good. Proof heaven is real, and yet, so hard to buckle down and move through the resistance to take the time to learn this skill. So, I appreciate working hard and learning foundations, and making working at a skill an every day event, but when our creative spirit is intact, the hard work comes from a place of joy and an authentic desire to master skills, and to learn more all the way around, rather than a dead feeling of never feeling enough, like an impostor, or like we do not belong. Fostering a positive connection and engagement to ourselves and to our world, I believe is perhaps the greatest skill we could possibly teach, and I believe it should be at the basis of all teaching! And yet, if I am very honest, I see that I have only been able to teach this when I have found this engagement and connection within myself. And of course, it is always a work in progress to be aware, and to know when I am getting sucked into black holes of old conditioning and deadened and limited ways of framing the world and experience. Just wait until I wake up! I'll be so rested, so ready to go, my little donkey spirit so ready to learn, grow, and practice with my body all the new things I get to experience today! I think I will dance Bollywood style today, with fresh powerdered colors exploding in the air around me! Just wait until you see my neon pink mane stand up and shimmy around as I dance to the music, as I move so fast I become a swirl of playful color myself! And if I make a mistake, I will try it again the next time around, and feel the ease in my body as I start to understand the movements better. Then I will give it another go! I notice that my body, mind and spirit are even freer, the more I try, and it feels even better! I am so small to the world, I just see glimpses of it, and it is amazing. So much to learn, see, experience. I love popcicles, the ones that are multi-colored, just like me! Look around and see the colors, movements, unique patterns of others and celebrate them. Learn from them. If you like something you see, try it yourself! 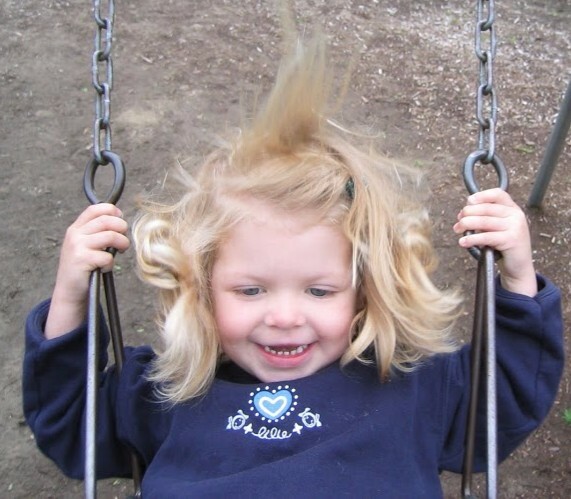 Let yourself be a complete beginner--a 5-year-old just taking in surroundings at kindergarten! Make an ocean painting that looks like mud, but just keep making more. See what your ocean begins to look like as you let yourself keep at it, and explore your sleeping creative spirit that is waking up! Remind yourself every day that it is worth all of it and more to allow the time necessary for your creative spirit to be fostered and to grow, to wake up in only the way that your creativity and engagement will awaken in this world, and then please take this connection and zest for life, and PASS IT ON! Don't be afraid to share yourself and even any feeble beginnings! Feeble beginnings can become miraculous endings! As a parent, I have the belief that kids need to live as kids when they are kids. This Phoenix pre-k is an amazing place to nurture growth, critical thinking and child development.